Diving ducks dive and feed at the bottom, often many feet below the waters surface. A pond should be at least 1 metre (3′) deep to accommodate diving ducks, it is also important that it has sloped sides to enable easy access and egress. Since some diving ducks do not like to leave the water it is necessary to place food dishes at the waters edge or place food on the water itself. Pochard and tufted duck are a good choice of starter species as they are both hardy, with a good lifespan and will breed well given the right conditions. Diving ducks encompass several tribes, pochards, sea ducks (including the subtribe of eiders) and stiff-tails. With their legs set further back on their body, closer to the tail than dabbling ducks, they are all ideally formed to be efficient divers but less well adapted for land. Diving ducks dive and feed at the bottom, often many feet below the waters surface. A pond should be at least 1 metre (3′) deep to accommodate diving ducks, it is also important that it has sloped sides to enable easy access and egress. Since some diving ducks do not like to leave the water it is necessary to place food dishes at the waters edge or place food on the water itself. Pochards are a group of 15 diving duck species, they are omnivorous therefore wheat and pellets is suitable to supplement their diet. European pochard and tufted duck are a good choice of starter species as they are both hardy, with a good lifespan and will breed well given the right conditions. Sea ducks are well adapted to sea life but the majority do nest inland, the tribe includes species such as mergansers and goldeneye and the subtribe eiders. These waterfowl do need a diet high in protein such as shrimp, pieces of fish and ground meat. In addition they can be fed wheat, pellets and finely chopped greens. 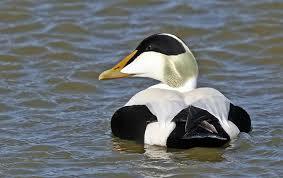 Eiders in particular are almost exclusively carnivorous. Stiff-tail ducks are a tribe distinctive in their appearance and behaviour, characterised by their long pointed tail. The majority are southern hemisphere ducks although ruddy duck and white-headed range far north and are more often seen in collections. The most aquatic of all waterfowl, it is important to supply grains on the water. that is up to a metre deep. Be the first to review “Diving Ducks” Click here to cancel reply.